Mmmmm, I love these things. I used to get them in the mall while shopping. Garlic breadzel with honey mustard dipping sauce yeeesss please! Well…the mall I go to does not have these things, even if they did I seem to recall those beloved treats being dunked in butter before serving. Maybe not the best of choice anymore. Better make my own I guess. Tada! Hehe yes, I even made the twist. Really simple. 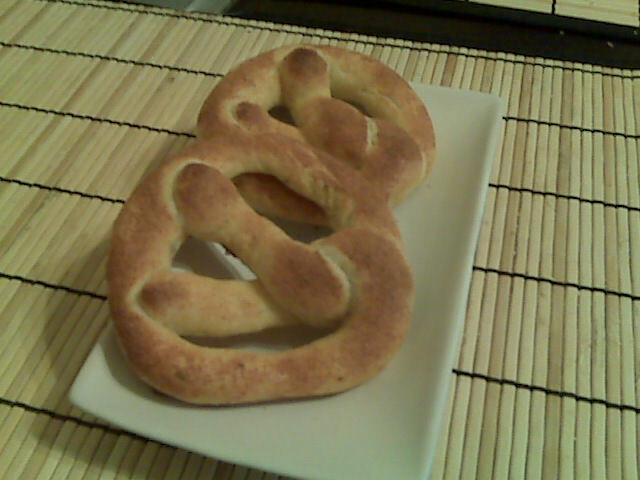 I watched Bobby Flay fail yet another throwdown and learned how to make pretzels look right in one easy entertaining step. If you have a bread makers this is so easy, just put all the ingredients (except the egg and herbs) in as per your breadmaker method and dough cycle it. If not you will need to knead and proof this twice. 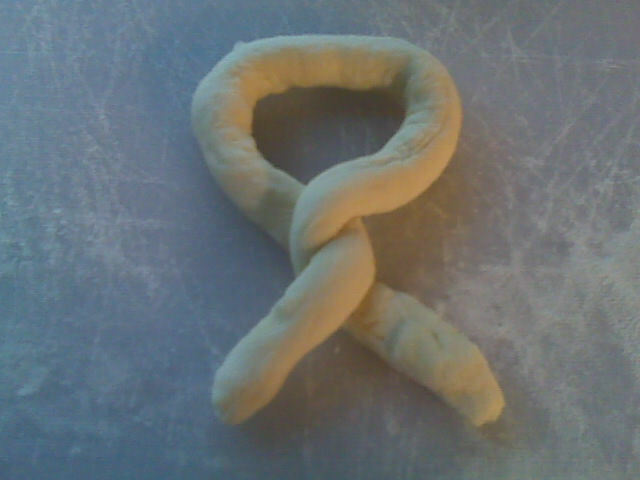 Once you have a nice dough, flour your surface and hands and roll out an 8 inch snake. 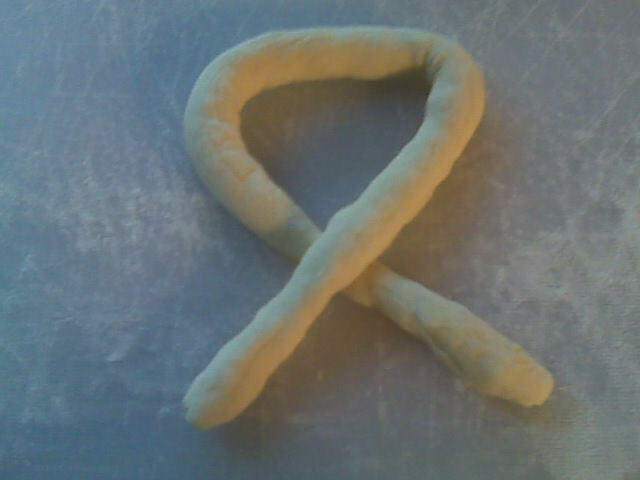 Come on, every kid who had playdoh has made a snake. You know how…tap that inner child! Time to make that shape, first you will want to cross one “arm” over the other like I’ done in our first picture here. 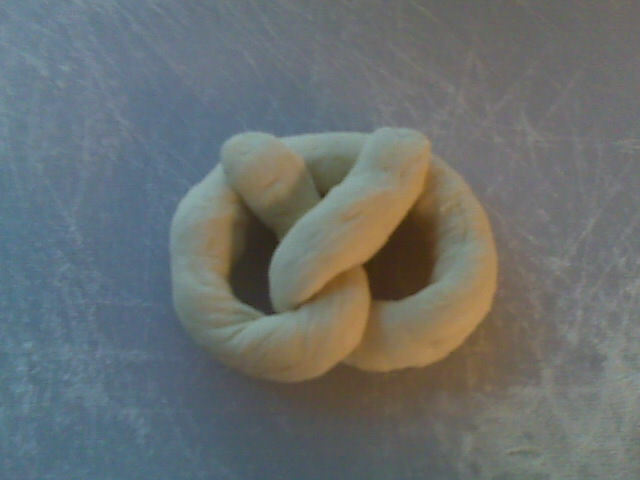 Then pick up one side and turn over the pretzel leaving the “arms” base in place. As seen in picture two here. Once you have all that settled it’s time to cheer…raise those arms up because you have yourself a pretzel as seen in the last two pictures. 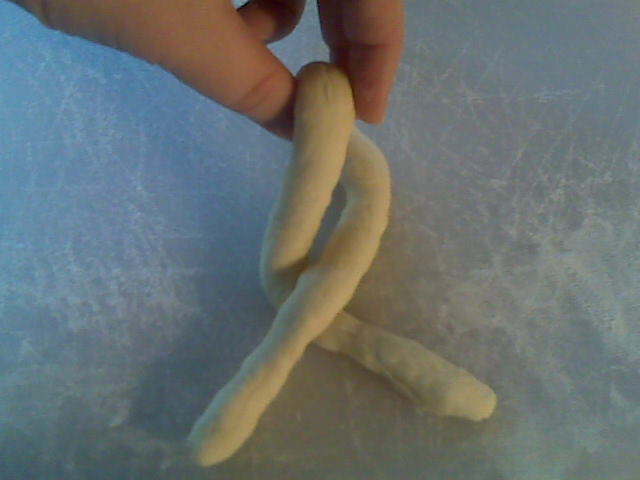 Sometimes I stretch my pretzel a bit to get that bigger loop shape. Brush each pretzel with some egg and sprinkle the topping of choice. I enjoy these with a bit of honey mustard while my husband likes these with some light cheese whiz. So many dipping options Check them out. Ready for the best news of all? The nutritional info, each pretzel is 80 calories, 0.6 grams of fat, and 0.7 grams of fiber. The recipe makes a dozen for some very happy snacking. Enjoy! This entry was posted in Snack and tagged Bread. Bookmark the permalink.